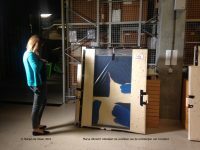 Cobra Art of Stedelijk Museum Schiedam is on the move again! Zentrum Paul Klee, Bern, Switzerland made a exhibistion around klee and CoBrA called ‘A – A Child’s Play’. From may 24 to September 5, 2011. Then it starts travelling to Louisiana Museum of Modern Art, Humlebaek in Denmark from September 30, 2011 – January 8, 2012. The third and last option to see the exhibition is in Cobra Museum of Modern Art, Amstelveen, The Netherlands, January 26 – April 22, 2012. Before transport to Bern all objects are examined and conditions are reported. During shifts from one place to the other, the works are examined again and conditions reports are consulted. SMS is very serious in taking care of their collection.